A missense mutation of Gipc3 was previously reported to cause age-related hearing loss in mice. 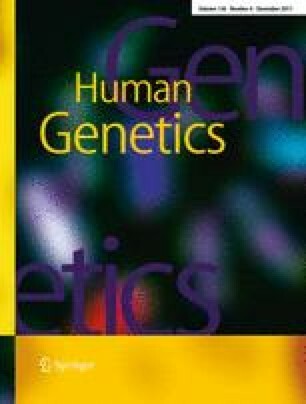 Point mutations of human GIPC3 were found in two small families, but association with hearing loss was not statistically significant. Here, we describe one frameshift and six missense mutations in GIPC3 cosegregating with DFNB72 hearing loss in six large families that support statistically significant evidence for genetic linkage. However, GIPC3 is not the only nonsyndromic hearing impairment gene in this region; no GIPC3 mutations were found in a family cosegregating hearing loss with markers of chromosome 19p. Haplotype analysis excluded GIPC3 from the obligate linkage interval in this family and defined a novel locus spanning 4.08 Mb and 104 genes. This closely linked but distinct nonsyndromic hearing loss locus was designated DFNB81. We thank the families who participated in this study and Andrew J. Griffith, Dennis Drayna, and Julie M. Schultz for valuable suggestions. This work was supported by grants from the National Institute on Deafness and Other Communication Disorders (NIDCD/NIH) R00-DC009287-03 to Z.M.A, from the Higher Education Commission, Islamabad to W.A., and from NIDCD/NIH DC03594 to S.M.L. Genotyping services were provided to S.M.L. by the Center for Inherited Disease Research through a fully funded federal contract from the NIH to The Johns Hopkins University, Contract Number N01-HG-65403. Work in Pakistan was also supported by the Higher Education Commission, EMRO/WHO23 COMSTECH and Ministry of Science and Technology (MoST, Lahore), and the International Center for Genetic Engineering and Biotechnology, Trieste, Italy under project CRP/PAK08-01 Contract no. 08/009 to Sh.R. Work at NIDCD/NIH was supported by intramural funds DC00039-14 to T.B.F. Experiments for this study were performed in Pakistan and in the United States, and comply with the current laws of the country in which they were performed.